Do you have an alternate?? In March and April, 1996, a group of genealogists organized the Georgia Comprehensive Genealogy Database. The idea was to provide a single entry point for all counties in Georgia, where collected databases would be stored. In addition, the databases would be indexed and cross-linked, so that even if an individual were found in more than one county, they could be located in the index. At the same time, volunteers were found who were willing to coordinate the collection of databases and generally oversee the contents of the web pages. Our names are Tim Seawolf-Self and Barbara Ann Peck. We're responsible for Murray County. If you would like to contribute your information to this page, please let us know. 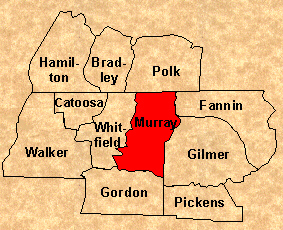 Murray County, Georgia was created December 3, 1832 from part of Cherokee County. The county was named for Thomas Walton Murray (1790-1832), an attorney who was a state legislator. U.S. Census reports are available for this county from 1840 to 1920. The county seat is Chatsworth. Turn off any signature line. You will receive a welcome message providing instructions on how to post to the list. The list is closed to non-subscribers; therefore, in order to post to the list, you must be a subscribed member. It's Free, it's Fun and you could find that missing ancestor that you've been looking for. Please post your contributions directly to the RootsWeb-hosted Board. You may wish to place queries on both the GenConnect Board and this Website. Please contribute your own family line through one or more surnames. We'll be happy to add it to this section. Kaye writes: "I have put up a new website for the young people of Murray County That are helping restore the John Bates Cemetery. I am dedicating this site to them." We think that this is one fantastic site...please visit it and enjoy the photos! He has also transcribed the text of three wills. We appreciate any information, photos, and texts concerning cemeteries and wills pertaining to Murray County, GA and will accept all contributions. Gerald D. Hodge Jr. has a new Website devoted to the 39th Georgia Volunteer Infantry Regiment. Murray County is represented in this wonderful work in progress. Check back often! include Headrick, Dunn, and Pritchett. The site contains substantial information about nearly 150 Murray County, Ga. men that died while serving in the Confederate Army? Most entries contain info from military records, county records, and Censuses of the county. You can access this info by selecting "War Dead" from the museum site's menu at top of page. By selecting "Photographs" from the menu, visitors can view some 250 photographs, including several from the War Between the States. Be sure to see individual photographs of the 6 brothers who served at the same time but not together, under the family name "Jackson." We also have the only known picture of Colonel William M. Luffman, Murray County's highest ranking officer in that war. Visitors to _www.murraycountymuseum.com_ (http://www.murraycountymuseum.com) who have an interest in the Trail of Tears can select from the menu "Cherokee Removal Fts" to access the full text of an impressive recent publication containing virtually everything known about the removal forts that were located in Georgia. Viewers can also print individual pages, sections, or even the entire book, if they desire. History of Murray County, by Charles H. Shriner, 1911. My Life and Travels, by Levi Branham, 1929. The memoirs of a man once a slave in the Vann House. Murray County Heritage, by Whitfield-Murray Historical Society team headed by Tim Howard, 1987. PRITCHETT This link goes to the genealogy Website of Steve A. Pritchett. 39th Georgia Infantry Regiment, Web Master: Gerald D. Hodge, Jr.
Genealogy of the Bible that includes: individual details, Bible cross reference, Hebrew meanings of names, lineages, dates, maps, timeline, contemporaries and Ancient dynastic history of Mesopotamia and Egypt. Visit the Galileo homepage, and check out its Digital Library of Georgia subsection. The information on this site is provided free of charge by the Webmasters. If you are being charged to access this information, please contact us.